I have known for some time that my great grandad, Andrew McDonough, who died in 1915, has his name recorded on the giant obelisk of the Helles Memorial, standing over 30 metres high and visible to passing ships sailing by the Gallipoli Peninsula in modern day Turkey. Private McDonough, aged thirty-nine, a coal miner from Wigan with six children, a veteran of the Boer Wars, signed up voluntarily for war service in December 1914. Less than eight months later he was dead. Surprisingly, I have only recently discovered that Private McDonough, who served in the Lancashire Fusiliers, also has his name recorded on the cenotaph in his hometown. On the weekend exactly one hundred years on from when Gavrilo Princip assassinated the Archduke Franz Ferdinand, the catalyst for the cataclysmic continental war that followed, I decided to pay a personal pilgrimage to visit the Wigan cenotaph and seek out my great grandad’s name. I could have got the bus or the train (perilous adventures in themselves), but I decided to walk to it. From my home in Clitheroe about thirty miles away. Having drawn a straight line on the map between Clitheroe and Wigan, it became clear that even in trying to walk the most direct way between to the two, I would pass along the way villages and towns with their own war memorials. So my walk became not just a pilgrimage in memory of Andrew McDonough, but I would pay my respects at each of the other memorials passed by chance along the way – places like Whalley, Blackburn, Tockholes, Abbey Village, Brinscall and Adlington. Even walking through just one thirty mile cross-section of Lancashire – from the Ribble Valley to the industrial conurbation of Greater Manchester along the edge of the West Pennine Moors – it quickly became clear that the scale of the county’s loss of life in the conflict was huge. This sacrifice was not just felt in the industrial towns. Rural villages and even the tiniest of hamlets all lost men. 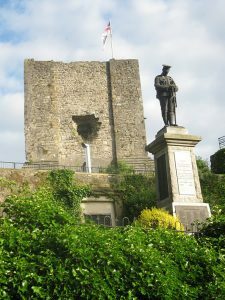 I started the walk from my house and visited Clitheroe’s cenotaph, the peaceful fallen soldier memorial so perfectly placed in the tranquil garden of remembrance beneath the Norman castle keep. This memorial has a breathtaking view across the town which encompasses the grand moorland sweep of Pendle Hill, a familiar view lost forever to the 330 men named on the monument. From here I followed field paths and lanes through the ripening meadows of the Ribble valley. I passed along the way the well kept roadside memorials in the villages of Whalley (52 names recorded) and Billington (48 names recorded). I climbed up the surprisingly steep-sided ridge behind the Nab, that separates the Rivers Ribble and Calder, and headed south-west along the ridge top to Dean Clough Reservoir, eventually dropping down to the industrial town of Blackburn. 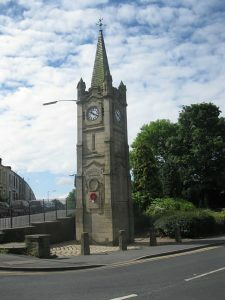 The town’s main war memorial is in Corporation Park but this was slightly off route. Yet virtually on the straight line of the route from Clitheroe to Wigan is the memorial clock tower at Little Harwood on the edge of the town centre, upon which some 96 names of the fallen are recorded. Tired and hot, it seemed to take me an age to cross Blackburn town centre via the Boulevard – presently a building site, as the old bus station has been erased as the first stage in its redevelopment into the optimistic sounding ‘Cathedral Quarter’. Crossing Wainwright’s Bridge and heading to Ewood, to save time I avoided the less direct field paths and followed the main road uphill to the straggling moorland village of Tockholes. 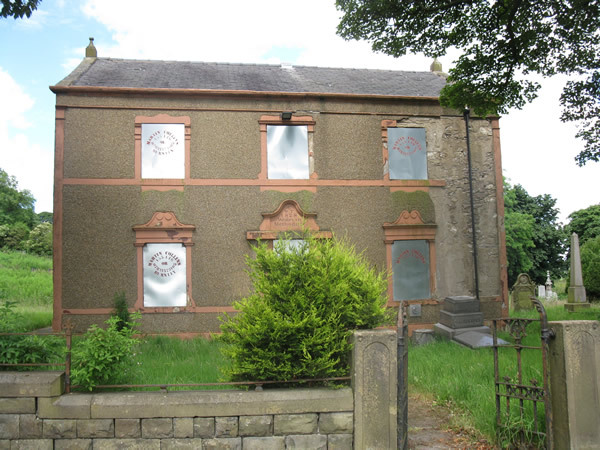 Halfway up the hill on the road from the town to the moors is the sad sight of the boarded up New Row Wesleyan Methodist Chapel, a simple listed structure with an 1828 date stone. Despite the overgrown nettles that choke the extensive chapel graveyard, even from the lane I spotted one solitary war grave: the simple white memorial to Private John Wolstenholme of the Manchester Regiment who died in 1917 at the age of 28. Another forgotten story. Another forgotten tragedy lost under the weeds of time. Uphill from here the road into Tockholes crosses over the M65 motorway and a brown road sign announces your arrival in the ‘West Pennine Moors’, the only significant geographical obstacle between Clitheroe and Wigan. I had still not decided whether to go over the moors or around them and was waiting to consult the OS map during my brief and long overdue lunch break sat on the bridleway by Tockholes church. Cheese butties never tasted so fine. The long history of the cotton industry is woven tightly into the fabric of this village. I sat and ate my lunch on an old packhorse route that once linked Preston with Rossendale. Nearby are the surviving handloom weavers’ cottages that predated the mills – but even these came to Tockholes and were still thriving when their workers signed up to fight in the Great War. Six names are recorded on a simple plaque attached to the lych gate of Tockholes United Reform Church recording those, ‘Who Gave their Lives For Their Country and Humanity In The Great War 1914-1919’. It is a reminder that every Lancashire community was affected by this conflict. On the map the straight line from Tockholes to Wigan takes you over Great Hill and Anglezarke Moor. I decided to save my legs this climb, despite the long spell of good weather which probably meant the route on to Great Hill was surprisingly dry for a change. Most of the year it is a muddy morass from Belmont Road to the summit shelter. I opted for the flatter, longer route to Anglezarke Reservoir via Abbey Village, Brinscall and the Goit to White Coppice. This gave me the chance to take in yet more village war memorials. 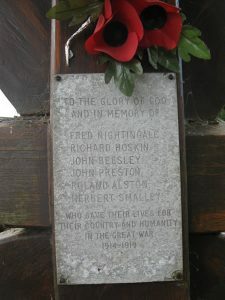 The marble pillar topped by an urn on Abbey Village’s main street, next to the primary school, records 19 names of villagers lost in the Great War. From here I crossed the old Blackburn-Chorley railway line to the distinctive hilltop church at Withnell. On the roadside by the church is the Celtic cross memorial to Private James Miller, awarded the V.C. after gallantry in relaying messages under heavy artillery fire in the Battle of Somme in 1916. His grave is in France, but the 26 year old has his own impressive Lancashire memorial overlooking the village where he worked in the paper mill. From here it is a short walk to the neighbouring mill village of Brinscall. Here an obelisk lists a staggering 84 names of men who gave up their lives between 1914-1919. I followed the Goit, a Victorian man-made waterway, constructed by Liverpool Corporation to link its Anglezarke and Rivington Reservoirs with the 1860’s reservoirs it built in the wooded valley of the River Roddlesworth. Before you reach Anglezarke you reach one of Lancashire’s most scenic cricket grounds, White Coppice, the perfectly situated little patch of greenery at the bottom of the brown moors. Thankfully, as I was walking this on a Sunday, the Pavilion kiosk was open – a cup of tea at last! Sat on a bench overlooking the cricket ground at White Coppice I optimistically felt within touching distance of my great-grandad’s name on the cenotaph in the centre of Wigan. I was at the portal to south-west Lancashire. The moors were behind me, even if I had gone around the edge of them. The reality was, I had knackered legs but was still a good eight or nine miles from my objective. Cyclists and families congregated at White Coppice but I soon left them behind once I climbed through Grey Heights Wood on the west side of Anglezarke. Through the parish of Heath Charnock, dominated by the rushing traffic along the M6 motorway, I followed field paths and tracks through rolling pastures, crossing the motorway and dropping downhill to the straggling A6 dormitory village of Adlington, with its divided loyalties between Chorley and Bolton. Just before the train station is reached, the village has its own war memorial set back in a little garden of remembrance. The district shed many men across the wasteful battlefields of France and Belgium and the memorial records a colossal 143 men who lost their lives in the 1914-18 conflict. I had stomped and stumbled my way on foot across the entire length of the OS Explorer Map 287 – West Pennine Moors. Reaching Adlington I found myself in the bottom left hand corner of this map, having started in the Ribble Valley at the top right corner of the same sheet. As the sun took its toll on me I succumbed to a swift pint of lager in The Bridge pub overlooking the towpath of the Leeds and Liverpool Canal. I had saved having a drink of beer until the last four or five miles of my walk – it would either act as a last booster or would further drain away what little energy I had left. What remained of my walk was a final slog along the canal towpath via the outskirts of Standish to Wigan town centre. When the green pastures hit the grey town I abandoned the canal and walked the quicker way down Wigan Road. It was a late Sunday afternoon, shop workers were rolling down metal shutters and beer soaked bluebottles buzzed in and out of the open doors of noisy pubs. Encircled by bland retail therapy – glass temples to shoes, handbags and mobile phones – Wigan’s sandstone parish church is a surprising gem. It appears a throwback to medieval times, even though the present structure is largely Victorian, designed by the eminent church architects, Sharpe and Paley. Just like the hundreds of war memorials that criss-cross the towns and villages of Lancashire, the diverse buildings restored and built by these two men spring up across north west England from provincial church spires to restored castles and stately homes. Sharpe and Paley even built Morecambe’s original railway hotel, The Midland. 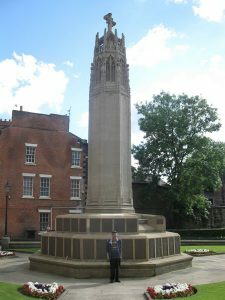 Dominating the flagged churchyard, Wigan’s octagonal cenotaph is no less impressive. This was designed by Giles Gilbert Scott, the architect famous for designing Liverpool’s Anglican Cathedral and the red GPO telephone box. Throughout the 1920’s he was up and down the country creating First World War memorials, including the one at Wigan, unveiled in 1925. The thing that strikes you most standing in front of this cenotaph is the colossal number of names recorded on it. The bronze plaques around the base of the monument apparently record nearly 1,800 names of the war dead in an industrial town that had a population of about 89,000 at the outbreak of the Great War. Thankfully I met my dad at the cenotaph. He knew exactly where his grandad’s name, Andrew McDonough, was recorded. 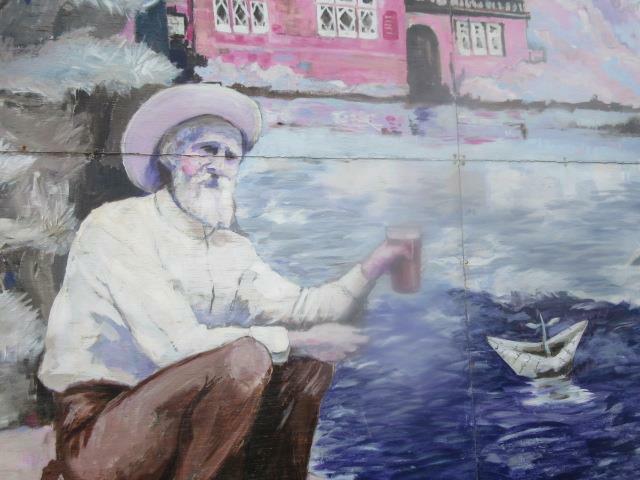 So here it was, my great grandad remembered in his hometown. We have no photo of him but thanks to the internet we have seen a photo of the starch collared, iron cross encrusted Heino von Heimburg, the German U-boat commander who killed him. 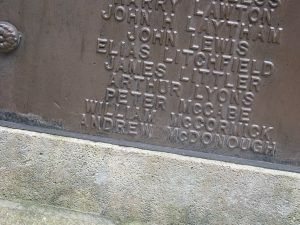 Andrew McDonough perished in the Aegean Sea on 13th August 1915. He had signed up for war service with his old regiment, the Lancashire Fusiliers, and was on board the troopship, Royal Edward, heading for Gallipoli along with nearly 1,400 other men. I would like to think he felt the warm Mediterranean sun on his face in his last moments and was not stuck in the deep bowels of the ship when the German U-14 fired two torpedoes which sunk the Royal Edward within six minutes. Some 300 men were rescued by nearby ships but over 1,000 men were lost to a watery grave. For Andrew McDonough there was no return to the Wigan coalfield. There was not even a body to bring back to its terraced streets and the comforting resting place of a town graveyard. His wife and six children lost their only breadwinner – their resulting poverty making them forgotten victims of the war. Brilliant Nick as always. Touching, erudite, witty, warm and sad. Glad to see you have this up and running and I’ll read it all and the additions – one of which I hope will be our re-run of the Manchester Pub walks we’ve talked about! Hey Mark, cheers for your kind words and support. You are the first one to comment on this new site! Thought it was about time I got my writing sorted. I have plenty more to write about the futility of the Great War. Yep – the Manchester Roman walk is long overdue. Need to sort it out this summer! Cheers again!